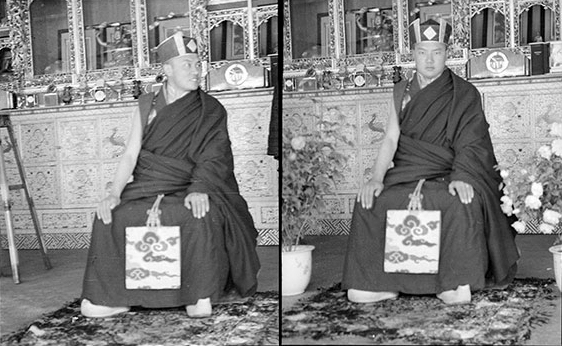 These pictures show the 16th Karmapa Rangjung Rigpe Dorje (1924-1981) wearing the black hat, seated on chair in a room in his summer palace at Tsurphu Monastery, probably in 1946. The photographer was Hugh Richardson, head of the last British and first Indian missions to Tibet. The photos are from the collection of the Pitt Rivers Museum, Oxford University . Tsurphu monastery, founded in 1187 by the 1st Karmapa Dusum Kyenpa (1100-1193) , is situated in the Tolung valley lies about forty miles to the west of Lhasa on the Drowo Lungchu river (see Google map). Until the 16th Karmapa’s flight into exile and the establishment of Rumtek Monastery in Sikkim, it was the principal seat of the Karma Kagyu school and residence of the Karmapa. Richardson statess “Its many buildings are closely grouped in a high enclosed wall overlooking the ‘Gro-bo-lung-chu [river]. 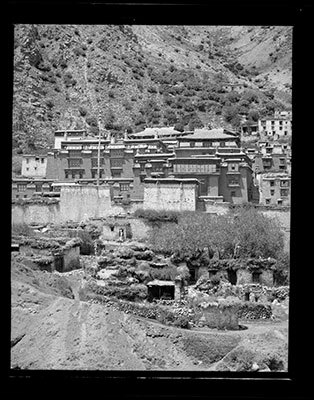 The entrance on the west side is by way of a courtyard in which stands an inscribed pillar dating from the ninth century…” Richardson visited Tsurphu twice – first in 1946 and a second time just before leaving Lhasa in 1950. The information and images are from the “Tibet Album” website of Oxford University. This entry was posted on Thursday, February 3rd, 2011 at 10:41 am and is filed under 16th Karmapa. You can follow any responses to this entry through the RSS 2.0 feed. You can leave a response, or trackback from your own site.